A friend of mine has a 15,000 pound tri-hull catamaran that he keeps at his waterfront home. He has built a marine railway to facilitate hauling out and launching the boat. He needed a winch to do the actual hauling with, and for various reasons, did not want an electric winch. He had the actual drum and planetary gearset for a 50,000 pound winch, and asked me if I thought could find a way to power it with a gas engine. I told him I was willing to give it a shot, if he was willing to live with the possibility that it may not work. He dropped off the winch and gave me the go-ahead. The first problem was to find a suitable engine. After some consultation (via the Internet) with some engineers and fabricators, we decided that direct mechanical drive via a centrifugal clutch would be the most cost effective and simplest way to do it. I was lucky enough to find an old refrigeration plant off a truck. 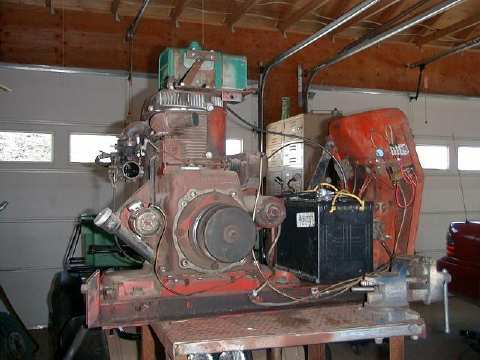 It consisted of a 15 horse, electric start single cylinder Wisconsin engine with solenoid throttle, a centrifugal clutch, compressor, belt and pulleys. I removed the compressor, rigged a control panel for start, choke, ignition and throttle, and a gas tank. The solenoid controlled throttle provides a start/stop function for the winch. With the solenoid in low speed, the centrifugal clutch drops out and the winch stops. With the solenoid in high speed, the clutch picks up and drives the winch. The next issue was to gear things down to provide a suitable line speed, and increase the available torque. This was done in three steps. 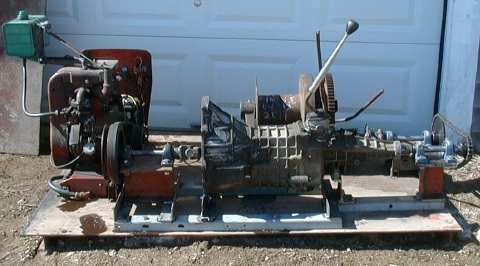 First I found a 4 speed transmission from a compact pickup. This provides 4 line speeds forward, and with the trans in reverse, also allows the winch to be used in "power out" mode for easing the boat down the railway when launching. The transmission was mounted to a subframe, with suitable jackshafts, universal joints and pillow-block bearings. 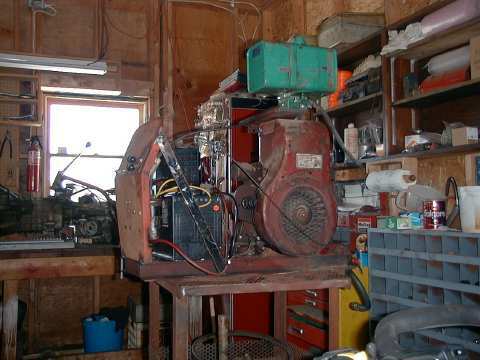 Next, the input to the transmission was driven via belt, from the centrifugal clutch mounted on the engine to the input jackshaft of the transmission, using the pulley off the compressor from the refrigeration unit. This also provided approximately 2:1 speed reduction. 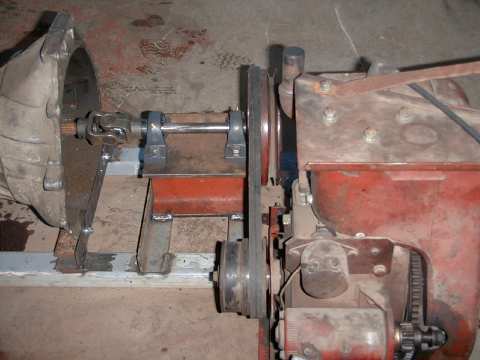 The third step was to chain drive the input to the winch assembly, again, via jackshafts. 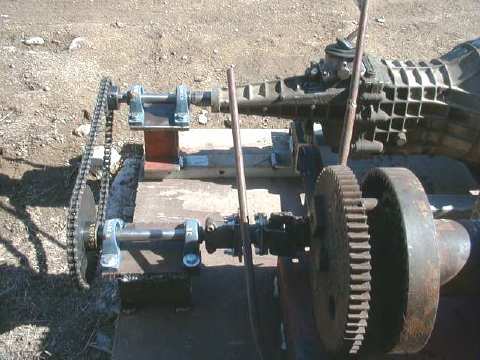 The sprockets were chosen to provide 2:1 reduction and give a reasonable pitch to the chain. Chain drive was chosen because of concerns over possible belt slippage due to the high torque at this stage of power transmission. The winch planetarys provide 25:1 reduction. 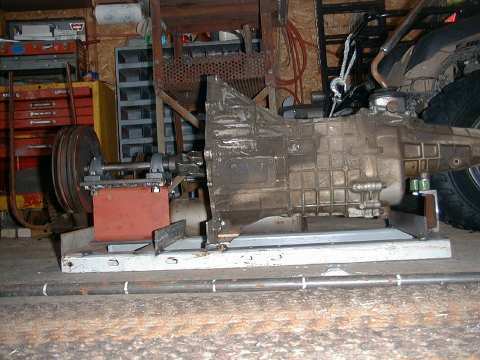 Finally, the engine, transmission and winch subassemblies are mounted to a large piece of 3/8" plate. The subassemblies are bolted down with 7/16" hardware. The plate was mounted to a concrete pad at the site. The owner reports highly satisfactory performance. He has included a remote switch to the throttle solenoid.